Check out or refreshed Iron Rangers! We have created our own CREW Trust language over the years, and our volunteers, guests and members often stop us to ask for explanations. CDT is Cypress Dome Trails. CMT is the Marsh Trails and BRS is Bird Rookery Swamp. And then there is the Iron Ranger. It’s not a band. And it’s not a sports team. 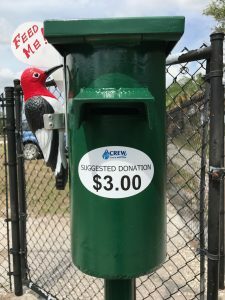 An Iron Ranger is simply a donation box, and we have one at each trail system. Because we do not have a visitor’s center and we do not charge admission, we rely on our kiosks and maps to offer information and our trusty Iron Rangers to collect donations. I’ll be the first to admit I very guiltily slink past the ranger when I visit CDT and CMT. I never have cash with me so instead, I donate online. I see it as a punch card; I’ve visited four times so I’ll donate $30 to cover that and my next six visits. Why donate? We use those donations to fund the education programs we offer for all ages. So, next time you’re at CDT or CMT, check out our newly re-painted Iron Rangers, complete with fresh, new birds to greet you and collect donations!